Country music singer Craig Campbell has partnered with NTI to release Public Service Announcements about job services available to Americans with Disabilities, including Disabled Veterans. Using Campbell’s 2016 county music hit “Outskirts of Heaven” as a background, the message conveyed is one of hope and freedom available to those with disabilities through job placement services offered by NTICentral.org. 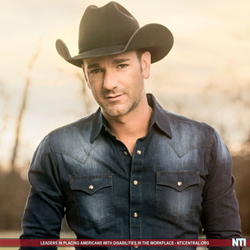 National Telecommuting Institute (NTI) (http://www.nticentral.org) today announced their collaboration with popular country music singer Craig Campbell. NTI and Campbell are working together to spread the word about NTI's mission and country-wide efforts to place Americans with Disabilities, including Disabled Veterans, back into the workforce. One in every five Americans has a disability, making Campbell's message about NTI valuable to more than 60 million people across the nation. A rising country music star, Campbell is an avid supporter of NTI's mission to help Americans with Disabilities and Disabled Veterans back into the workplace. Campbell took time out of his busy touring schedule to record several PSAs for NTI. His most recent hit "Outskirts of Heaven" (Broken Bow Records/2016) serves as the background music for the PSAs. The messages are designed to increase public awareness of NTIs job placement services. Campbell's passion for living shines clearly through his music, and now Campbell shares that passion in collaboration with NTI as he helps spread the word about NTI's ability to help disabled Americans gain freedom and independence through employment. According to the Bureau of Labor Statistics, in 2015 only 17.5 percent of persons with a disability were employed compared to 65 percent of those without a disability (https://www.bls.gov/news.release/pdf/disabl.pdf). In addition, unemployment rates among Americans with disabilities were reported to be more than 5 percent higher than those without a disability. NTI and Campbell are working together to reach those people and make a positive difference in their lives. NTI was founded in 1995 as a 501(c)(3) nonprofit organization, and has been helping Americans with disabilities for more than 20 years. About NTI: National Telecommuting Institute (NTI) is a 501 (c)(3) not for profit organization with headquarters in Boston, MA. It has been supporting Americans with disabilities since 1995. NTI provides training and job placements in work at home positions across the United States. NTI pioneered staffing virtual call centers with Americans with Disabilities, including Disabled Veterans, who work from home. About Craig Campbell: Campbell's talent and dedication to his craft launched his career in Nashville in 2011. Originally from the small town of Lyons, GA, Campbell has used his small town grit to overcome the inevitable bumps in his career path. Although he has experienced setbacks, he has never once wavered from his mission to bring his fans country music that tells Campbell's own story in a timeless way. He released his first debut single, "Family Man" in 2010. Since then, Campbell has released numerous singles like "Keep Them Kisses Comin'," "When I Get It," "Outta My Head," "Fish," and most recently with Red Bow Records, "Tomorrow Tonight" and the ever popular "Outskirts of Heaven." He is currently working on his third album about which he said, "You can expect some great music with a little more energy, and a lot more fire."